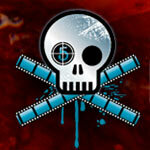 of the H. P. Lovecraft Film Festival Classics Vol 2 DVD. 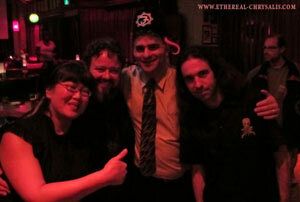 • Bonus Materials - Trailer for "The Call of Cthulhu" (2005), "Transcendent" (2012), a selection of photos & past guests from HPLFF history. 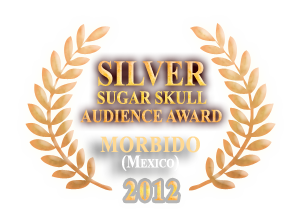 Ethereal Chrysalis director/writer/actor Syl Disjonk will attend the MORBIDO film festival (November 15th to 18th) for the Mexican premiere of his his twisted short film in Pátzcuaro, Michoacán. 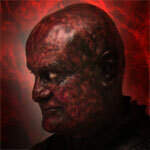 Syl Disjonk will also take part in art hexibition at the Ancient Jesuit College. 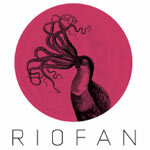 The fantastic short film Ethereal Chrysalis will be screening for the first time in Brazil at the Riofan Festival Fantastico Do Rio. The fantastic short film Ethereal Chrysalis is part of A Night of the Grotesque featuring the films of the stop motion genius Robert Morgan presented by All Things Horror. 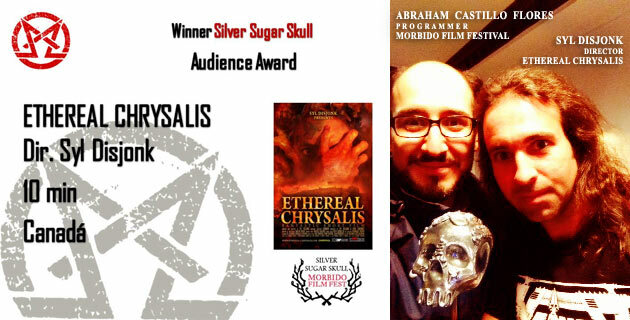 The fantastic short film Ethereal Chrysalis will open for the feature film The Sigil at Los Angeles Fear and Fantasy film festival. 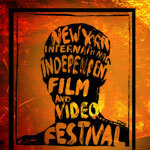 Freshly back from Europe, fantastic short film Ethereal Chrysalis will now continue a successful round of screenings in the U.S.A.. Director/writer/actor Syl Disjonk will attend the Los Angeles edition of the New York International Independant Film & video Festival for the Hollywood premiere of his surreal offspring. The fantastic short film Ethereal Chrysalis will be presented for the first time in Australia as part of the Lovecraft Actually program of A Night of Horror Film Festival in Sydney. 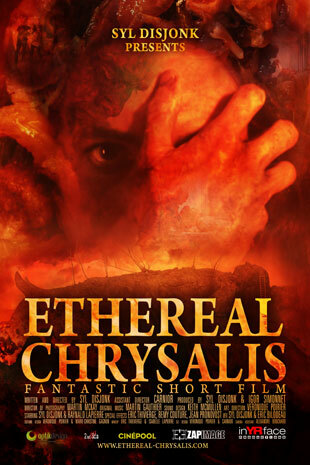 Fantastic short film Ethereal Chrysalis continue a successful round of screenings in the U.S.A.. After visiting Portland where it flabbergasted the H.P. Lovecraft Film Festival audience, winning the best short film award at the Minneapolis Underground Film Festival and having a blast at Festivus Film Festival in Denver, Ethereal Chrysalis director/writer/actor Syl Disjonk will now attend the Queens World Film Festival for the New-York premiere of his surreal offspring. Part of Twisted Short Stack, Ethereal Chrysalis is nominated for the Queens World Film Festival's Best Going Rogue Film, along with Chronicles of a Professional Eulogist, Violet to Earth and Open City. 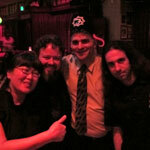 After opening for the H.P. 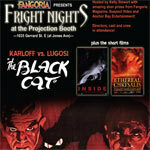 Lovecraft inspired From Beyond in France and winning the best short film award at the Minneapolis Underground Film Festival, the surrealist horror short film Ethereal Chrysalis will be screened before "The Black Cat" as part of Fright Nights at the Projection Booth presented by FANGORIA in Toronto Canada. 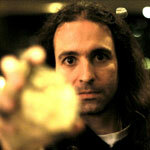 Also on the bill, the twisted short film Inside directed by Yaz Rabadi, noticeably presented at the CANNES Film Festival. The fantastic short film Ethereal Chrysalis will be presented for the first time in Europe as part of the Séances Hallucinées of the ZoneBis association. Opening for the H.P. 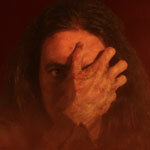 Lovecraft inspired From Beyond directed by Stuart Gordon (Re-Animator, Fortress, Dagon). 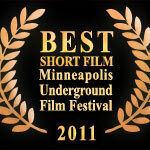 After winning the award for the best short film at the Minneapolis Underground Film Festival writer/Actor/Director Syl Disjonk will take a trip from Montreal, Quebec, Canada to attend the 5th edition of the Festivus Film Festival in Denver Colorado. 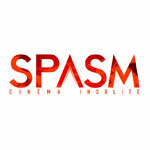 His fantastic short film Ethereal Chrysalis will be screened as part of the Abstract / Experimental short films program. 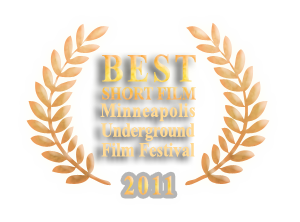 The fantastic short film Ethereal Chrysalis directed by Syl Disjonk won the best short film award at Minneapolis Underground Film Festival. 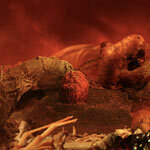 Based on Syl Disjonk's nightmares, Ethereal Chrysalis previously won in ex-aquo the best film award at Festival Vitesse Lumière in Quebec city, Canada. 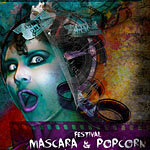 The fantastic short film Ethereal Chrysalis will be screened at Mascara & Popcorn's: NIHILISME - DIGGERFILMS FUNDRAISER. 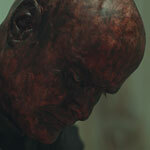 Syl Disjonk and his short movie Ethereal Chrysalis are having one of their buzziest week from October 24th to 29th. Actually, the fantastic short film will now travel to Buenos Aires, Agentina and will be presented at the Buenos Aires Rojo Sangre Festival Internacional de Cine de Terror, Fantástico y Bizzaro as part of the Competencia Internacional de Cortometrajes on October 28th. 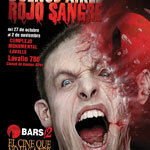 Ethereal Chrysalis : don’t miss the call… This time, it will be Rojo Sangre ! Ethereal Chrysalis, a fantastic short film directed by Syl Disjonk will be presented at the Toronto After Dark Film Festival. Part of the 16 short films composing the Canada After Dark selection, Ethereal Chrysalis will be presented this Tuesday, October 25th at 9:45 PM at the Toronto Underground Cinema just before Manborg, a Steven Kostanski's 80s style sci-fi feature about a cyborg killing machine. 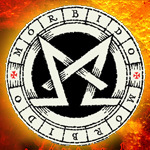 Manborg and Ethereal Chrysalis will both have their Toronto premiere in this event co-presented by the Nerd Mafia. Montreal 8 PM at Grande soirée horreur at Club Soda. 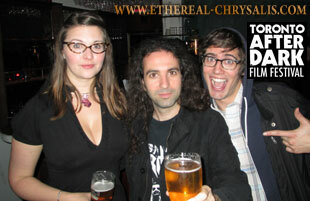 So far the fantastic short film Ethereal Chrysalis received its best crowd reaction at the H.P. Lovecraft Film Festival and the sold out Hollywood Theatre of Portland Oregon was totally flabbergasted by the Lovecraftian dementia of Ethereal Chrysalis. 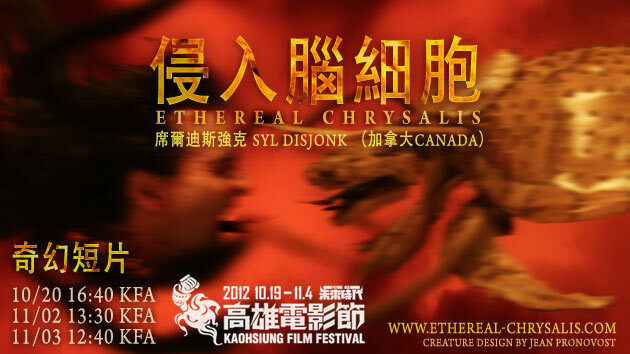 In collaboration with Festival Vitesse Lumière the surreal short film Ethereal Chrysalis directed by Syl Disjonk Chrysalis will have is first screening in high definition at the Festival de cinema de la ville de Québec opening for The Corridor feature film programmed by Fantasia. at the Hall Theater 1455 de Maisonneuve W.
Inside the Ça Craint short film program of the Quebec Fantastic Short Film Week-end. 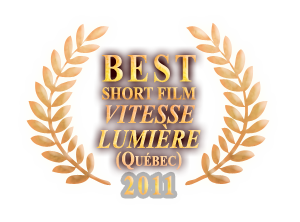 was screened at Festival Vitesse Lumière in Quebec city, Canada on June 3rd. Although the film was officially out of competition. 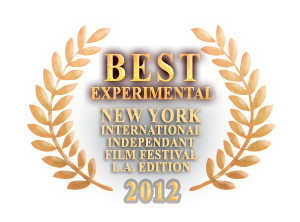 We won ex aequo the prize for best film with All Flowers In Time directed by Jonathan Caouette. The jury was composed of Martin Dubreuil (musician and actor), Erik Canuel (director: Bon Cop Bad Cop) and Jarrett Mann (Spasm Festival).